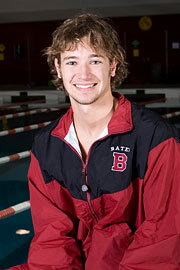 Bates senior Chris Berry (Augusta, Maine) finished his exceptional collegiate swimming career with the best weekend of his life last weekend at the NESCAC Men’s Swimming and Diving Championships. Berry broke or had a hand in breaking an astounding total of seven Bates event records at the meet, while the Bobcats set 13 new event records as a team. Berry swam the leadoff leg in four relays for Bates that broke school records: the 200 free (1:25.46), the 400 medley (3:29.68), the 200 medley (1:35.64) and the 400 free (3:08.15). Berry also reset two program records he already owned, in the 50 back (24.11 seconds) adn the 100 back (52.29), and also claimed his first Bates freestyle record on the final day of the meet, swimming the 100 free in 47.52 seconds. In his final event, the 200 backstroke, Berry passed the torch, in a sense, to first-year teammate Nathaniel Depew (Hudson, Ohio). While Berry broke his own former program record of 1:57.10 in the event, finishing in 1:56.30, Depew raced even faster, finishing 11th overall with a time of 1:54.82. It was a poignant way for the team captain to finish out an outstanding career.